It might look like any other 356 replica on the market, but it's not. This is the Carice MK1, and not only is it electric, but the company claims this little Roadster comes in at an unbelievable 770 pounds. No, seriously, I don't believe them. Back in 2006, they showed off a cool little roadster in Geneva, and two years later brought it to the Chicago Auto Show promising to sell cars in the states. As far as I can tell, that never happened. Chicago Auto Show: Is The YES! 3.2 Roadster For Real? Yes! Why do I bring up YES!? (Again, not yelling.) Because Carice shares space in the same building as YES! in Delft, a small city in the Netherlands. This strikes me as an odd coincidence. With that in mind, Carice says it's been building cars under the radar since 2009, but the MK1 is the company's first proper production model. 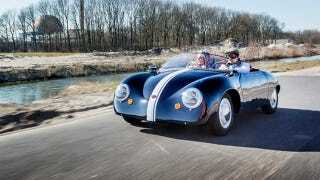 They claim the chassis was developed and built in-house, since nothing available would suit their needs, and that the MK1 has nothing to do with the 356 (or for that matter, the Beetle) other than cribbing the upside-down bathtub styling and replicating it in plastic. Check the interior photo above and you can see a square tunnel running through the middle of the car that's supposedly housing a lithium-ion battery, ala Chevy Volt. Two battery/motor combos are available: a 15 kW (20 hp) motor with a range of around 70 miles or 40 kW (54 hp) with a larger pack good for around 120 miles. They're even offering a 4 kW (5 hp) version for kids under 16 with overtly wealthy parents and will fit a small engine to act as a range extender on the big-boy models. But back to that insanely low curb weight. Even with a fiberglass tub and paper thin plastic body panels, I can't see how they've made something that weighs 770 pounds with a battery, a motor, and that surprisingly plush interior. Could it be done? Sure. But they're selling 10 of these things for 22,000 euros a pop, and expect to make a profit on each. And the fact they're not responding to repeated emails makes me even more dubious. Yes, it's pretty. And I like the idea of a sharp, lively little electric runabout, but the MK1 is looking more like another link in a long chain of enticingly attractive Dutch vaporware.